Everyone is stuck at home once again with the snow and ice storm that blew through last night. I think we all need to get chains on our tires for next year. Anyone with me? I’m blessed enough to have a little gym and treadmill at my house, so there’s absolutely no excuse for me not to work out while we are snowed in. I did an hour run and then decided to hit the kitchen for some lunch. I mean, what else is there to do besides eat on snow days? Actually, I’ve been working all day on programs, scheduling, my new business… but, hey – a girl’s gotta eat! 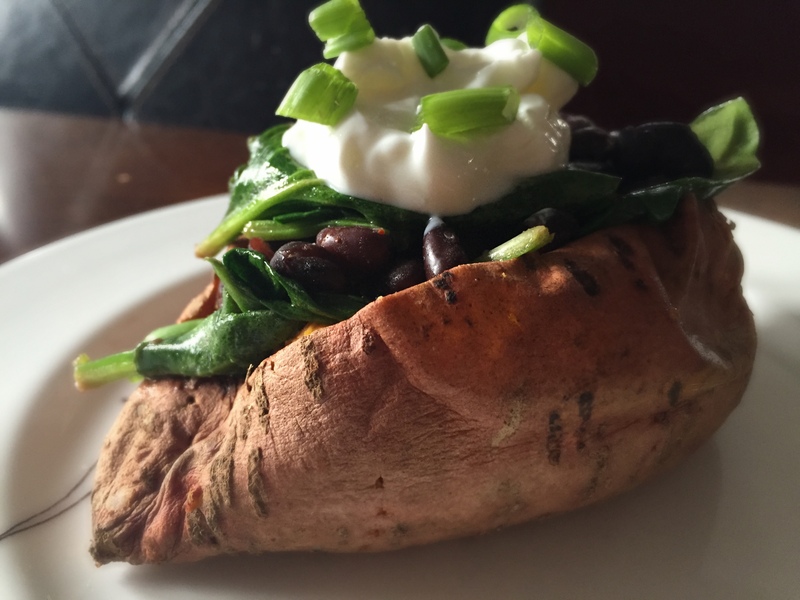 I found the recipe for this black bean and spinach stuffed sweet potato on Women’s Day and adjusted it a bit and for a party of one. Super simple and super delicious!! I’m also including a little at home workout for those of you who are snowed in with no workout equipment! If it’s not enough for you – do it all the way through and then backwards. 🙂 I hope you enjoy the workout and the sweet potato! Pierce the potato all over with a fork, place on a microwave-safe plate and microwave on high, turning over halfway through, until just tender usually 6-8 minutes depending on the size. When you flip the potato, heat the oil and garlic in a large skillet over medium heat. Add the beans, cumin, cayenne, and 1 tablespoon water, increase the heat to medium-high and cook, tossing, until the beans are heated through, about 2 minutes. Add the spinach, season with 1/4 teaspoon salt and pepper and cook, tossing until beginning to wilt, 1 to 2 minutes; remove from heat. I also cut the lime into quarters and squeezed a quarter over the bean mixture while cooking.